TEG-1000 Tungsten Electrode Grinder is a more convenient, safer and accurate way than other methods of grinding Tungsten Electrodes. 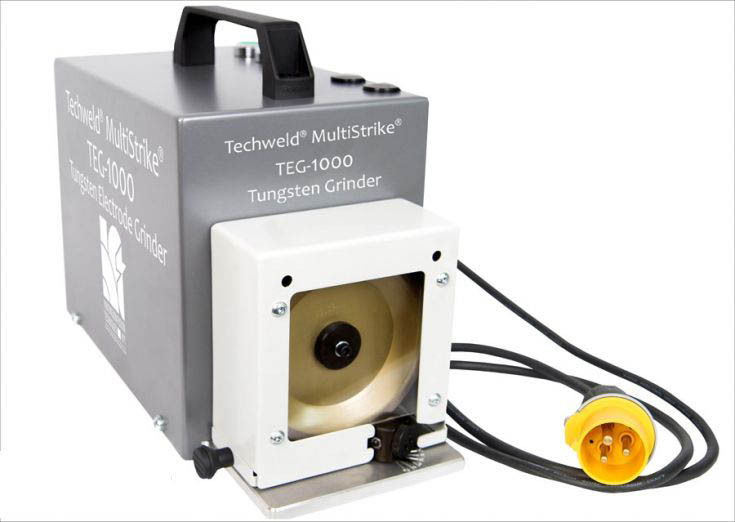 The TEG-1000 Tungsten Electrode Grinder will give repeatable Tungsten Electrode points every time, enabling consistent repeatable arc performance and welding results. Sizes 1.0 to 3.2 mm can be ground as standard, with other sizes catered for with an easy collet change available as an accessory. With Tungsten Electrodes ground and polished, mechanised welding can produce identical, repeatable results every time. Through manual welding, the shape of the Tungsten Electrode is just as important. A correctly shaped tip can ensure the arc is precisely positioned with none of the preferential arcing experienced when using poorly shaped manually ground tips. 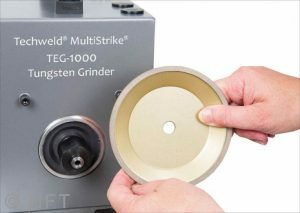 By grinding the points longitudinally, the TEG-1000 Tungsten Electrode Grinder eliminates arc flicker or wander. Savings can be achieved because of the increased life of properly ground Tungsten Electrodes. With the special collect accessory, shorter tungstens can be held, significantly increasing the length of life of each Tungsten Electrode before it is discarded. 110 Volt and 220 Volt versions 50/60 Hz. Can be retro-fitted to an extraction system. Easy to use collet and angle guide system. 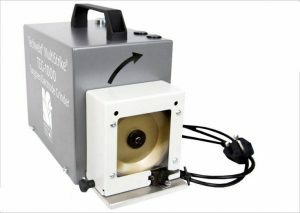 Integral handle making unit portable and easy to move about in the workshop. A published technical paper is available about tungsten electrode grinding, a copy of which is available on request. Tungsten Electrode Grinders ‘Long Life’ Diamond Grinding Wheels for our ‘unique’ models TEG-2 and TEG-3 continue to be available as replacements. 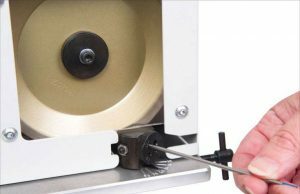 The wheel on the ‘New’ TEG-1000 Tungsten Electrode Grinder is the same. Grinding Wheels were specifically developed by HFT® to produce long lasting and long life results. We continue to have availability of Replacement ‘Long Life’ Diamond Grinding Wheels. These Replacement ‘Long Life’ Diamond Grinding Wheels are available for immediate delivery and will always be available to all our customers.